You will find that this Connect is light enough to easily tow, but it is not light on amenities. 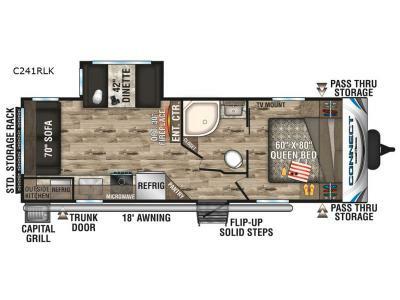 All of the things that you love about your home have been included in this trailer such as full kitchen and bath amenities, furniture in the living area, and options to customize your travel trailer. The front private bedroom offers a queen bed and a separate place for you to unwind and relax from the day's adventures, plus a private bath entrance. 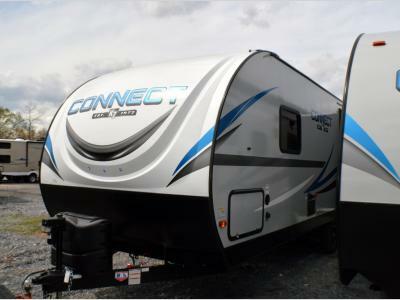 Because this unit can sleep five people comfortably during any wilderness excursion, you can bring along the whole family for a weekend of fun. You will also feel confident in bringing along any necessary camping gear because the exterior pass-through storage will hold several items. Each Connect travel trailer by KZ RV offers the Climate package featuring a heated, insulated and an enclosed underbelly for four seasons of outdoor adventure. Some of the additional highlights include wider doorways, LED motion sensor lights, residential kitchen amenities including a pantry for lots of dry goods, flush-floor slides, and sturdy flip-up main entry steps. You will also find plenty of exterior storage areas that are sizable and easy to clean, plus include extra-large radius doors with magnetic catches. 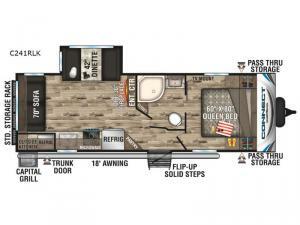 It's time to enjoy the journey, get ready and choose your favorite floorplan!